Save the Rainforest Sweden works to protect rainforest in Ecuador and Colombia in association with local partners. We concentrate on areas of extremely high biodiversity within the Choco region, one of the biodiversity hotspots of the world. We work through direct acquisition of forest and through agreements with landowners, creating reserves and connect large areas of forest to safeguard green infrastructure. Most of the forest we preserve is primary forest which have never been cut; some is secondary, recovering forest. All of the forest is subject to threat from loggers, agriculture and plantations. We also conduct activities to support local sustainable development and deal with underlying causes of deforestation. In cooperation with our partners we arrange environmental education, develop sustainable agriforestry practices and ecotourism. We also cooperate with research institutions. 1. Cambugan watershed, Ecuador. 2. Children planting trees. Save the Rainforest Sweden is a small NGO with a big ambition. We work efficiently with the aim to protect and where necessary restore tropical forest in respectful cooperation with local population. Our resources come from gifts from people in Sweden and from swedish business who often donate or invite their customers to donate as part of their sustainability work. Almost all of our resources are forwarded directly to our partners in Ecuador (Fundación Cambugan, www.cambugan.org) and Colombia (Serraniagua, www.serraniagua.org). They are well respected NGO:s with a big commitment to forest conservation, and we keep close personal contact with them. Both organisations has been awarded: Fundación Cambugan with a sustainability award from the City of Quito and Serraniagua with the The Critical Ecosystem Partnership Fund award “Hotspot Heroes”, to organisations who have made outstanding contributions to the conservation of the world’s most biologically diverse yet threatened terrestrial regions. Forests are important carbon sinks, excellent at capturing carbon and storing it. They absorb CO2 from the atmosphere, storing it in tree bark, wood, roots and soil. The amounts of carbon and the linkages between forests and the atmosphere are not fully understood, but generally, keeping heathy ecossystems is about the most important we can do to mitigate climate change. 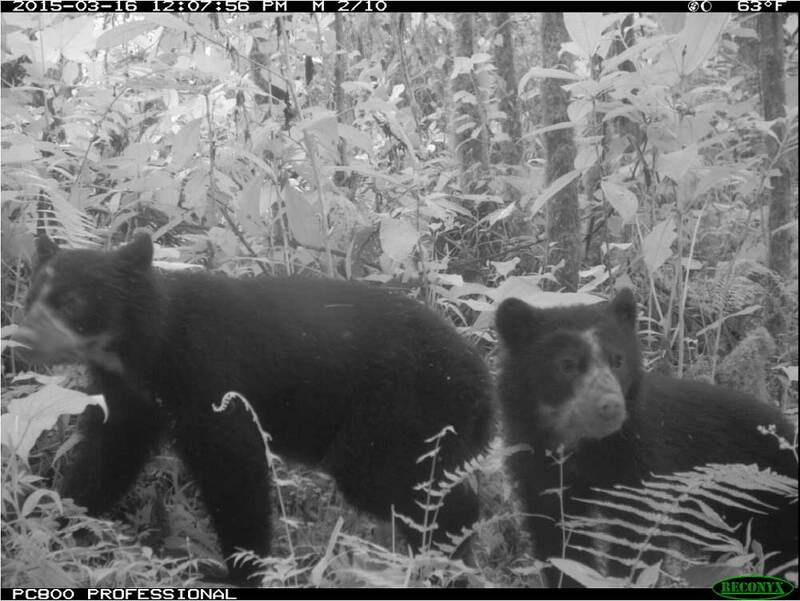 Spectacled bear cubs captured by a camera trap as part of a research project. Spectacled bear is an endagered species found in the areas Save the Rainforest Sweden work in.